In true “It Takes a Village” fashion, young girls in Native American villages were taught by all the other women in the village and learned to do the work of making baskets, working the fields, and cooking. And while there wasn’t a traditional school, children learned history and moral rules from entertaining and meaningful stories told by the elders. Speaking of rules: If a child disobeyed, the regular punishment was to be teased in front of the tribe (instead of other then-standard methods of corporal punishment, the lack of which shocked European settlers who were early observers of Native American life). But if they obeyed or did something well, they were honored and praised in front of everyone! This small tradition only touches the surface of what Native life was like for early tribes. 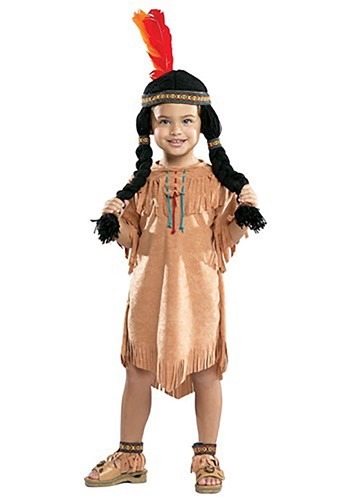 If you’re as into learning about and honoring their culture as we are, then you’ll love this Native American Girl Toddler Costume! The tan dress with fringes and red and blue cords will help spark your child's imagination, and the ankle fringes and black yarn wig will let them step into a moment in time and see life through another person's eyes!